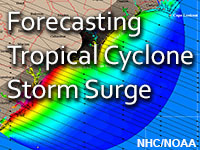 This lesson introduces forecasters to the various probabilistic guidance products used by the National Hurricane Center to forecast storm surge. It provides an overview of how these probabilistic surge products are created, their purposes, and why they are preferred to deterministic-only style guidance for specific events. The lesson also provides practice in correctly interpreting probabilistic storm surge guidance at various phases of an event. Basic familiarity with probabilistic forecast guidance is required. This lesson contains particularly interesting information about the vulnerability of forecast areas to hurricane damage. This lesson would be very helpful to people living near the coast to determine if they are in a path of a storm. This module was very informative. It increased my understanding of this topic greatly. Exactly the insight into NHC products I was hoping for. Effectively explained and re-explained more difficult topics. This module presented the material in a very practical manner. It is essential that meteorologists and emergency managers in coastal regions understand the current set of forecast products available to them. I would highly recommend this course. Explain how probabilistic surge guidance is created, and why it is preferred to deterministic-only surge guidance for specific events, given the assumptions and potential errors associated with deterministic predictions. Explain the different forms of probabilistic storm surge guidance, and describe the purpose and use of each. Explain how the Maximum Envelope of Water (MEOW) and Maximum of the MEOW (MOM) are developed, and describe their purpose and use. Use surge guidance and output in its various forms (i.e. MEOWs, MOMs, Probabilistic Storm Surge) and at various phases of the event. storm surge, surge, probabilistic, deterministic, ensemble, MEOW, MOM, SLOSH, P-Surge, decision-support. Oct. 31, 2016: One sentence has been revised in the question feedback in chapter 4, section 2. Previous version: "The MEOW is showing location-specific maximum surges for many category 3 hurricanes, moving northwest at 15 mph, and making landfall anywhere on this stretch of coastline." New version: "The MEOW is showing location-specific maximum surges for many category 3 hurricanes, moving west-northwest at 15 mph, and making landfall anywhere on this stretch of coastline."